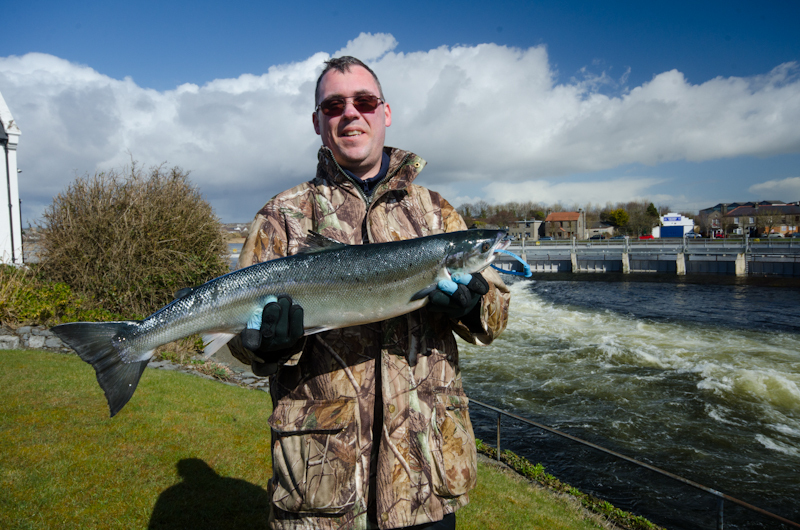 Castlebar - County Mayo - First Galway salmon of 2015 landed! Very glad to report that the first salmon of 2015 was caught in Galway just before lunchtime today (24 March 2015). The fish was taken on shrimp by local angler Eoin Trill, from the Claddagh in Galway, and weighed 9.5lbs. Eoin Trill with the First Galway Salmon of 2015. Those of you who know Eoin will know that this was a very special catch, as he underwent a heart transplant just 5 months ago. I know that getting back fishing was one of the things that kept him going during his illness and subsequent recovery, and he was absolutely delighted today. Staff at the Galway Fishery and IFI congratulate Eoin and are delighted to see him back fishing. This is the third time that Eoin has managed to land the first salmon in Galway, and we're sure it won't be the last. As is customary, the salmon was donated to charity, this year the Galway Hospice is the recipient.